THE STORY: Isobel Lambert is the head of the Committee, a group based in Britain which attempts to thwart terrorist groups. Isobel is known as a sleek, cold, dangerous professional. She is reaching the limit of her tolerance of this life, however, and the young, vulnerable girl she was keeps showing through. Seventeen years ago, that young girl killed the man she spent two weeks in France with. Unknown to her, he survived and became the terrorist Serafin who makes a deal with her bosses at the Comnmittee. She has to save him and thus discovers that he is man she loved and hated and thought she had killed. OPINION: I am a big fan of Stuart’s anti-heroes who are always on the edge of being the villain. Here, Isobel and Killian are both anti-heroes of a sort. They are a danger to one another even as they rely upon one another to reach safety. Both are dark characters who have killed and live in a shadowy world. The moral line of what is right and wrong is complicated and blurry here. I especially liked the interweaving of the past and present stories such that secrets are revealed in the past which illuminate the present. Isobel and Killian are an interesting combination. The constant danger and lack of truth between them makes their story fascinating and complex. I also especially like the softening of Isobel without making her weak. She remains a professional and yet readers are allowed to see her deep caring for her comrades and eventually also for Killian. As a fan of the Ice series, I also really liked seeing past characters (I won’t spoil who) and this time we get an update on their lives which was satisfying. FINAL DECISION: The story of two people who both lead deadly lives, I loved how the book is romantic and yet not at all sentimental. I loved the interactions between Isobel and Killian. 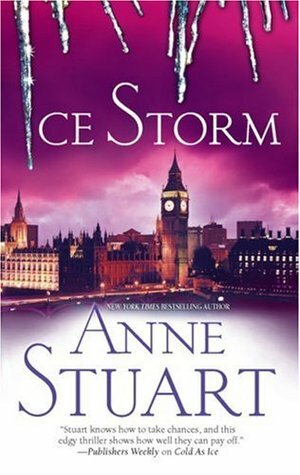 CONNECTED BOOKS: ICE STORM is the fourth book in the Ice series. It can be read as a standalone although I think because it deals with and includes characters from the entire series, it will be better appreciated when read after the other books of the series.